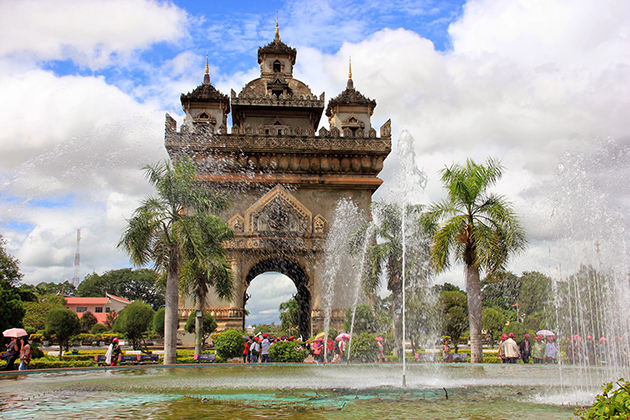 The laid-back capital city of Laos has become a place of thousands of visitors’ interest with an ever-increasing demand of Laos tours by both domestic and international travelers to explore this miracle land. 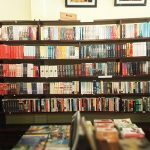 There are loads of amazing things that Vientiane surprises you. As Laos’ largest city, Vientiane has a plenty of things to offer from sleepy tuk-tuk drivers to reasonable spas. Laos, according to a majority of foreign visitors, conjures up the image of a historic old quarter with streets and boulevards where there is a high concentration of temples with Buddhist monks wandering around, dragon statues or even affordable spas. Among all, Buddha Park is a highlight of this laid back capital city. 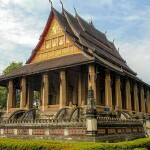 Vientiane endears itself to visitors for its best sights that best reflect the soul of a former trading post. Being home to a number of top attractive tourist destinations including the renowned COPE Visitor Center, Pha That Luang, Wat Ong Teu Mahawihan, Laos Textile Museum or Xieng Khuan, Vientiane, for sure, offers best experience beyond your wildest dream and Buddha Park is definitely a not-to-be-missed place. Erected in 1958 by Luang Pu Bunleua Sulilat, Buddha Park is home to not only Buddha images but also Hindu gods, coupled with demons and animals originating from both Buddhism and Hindu beliefs. Among a broad collection of Buddha and Hindu images, most remarkable ones are Indra, a for-armed deity sitting on a horse, an deity with 12 faces and plentiful hands, the king of Hindu gods who riding the three-headed elephant. Each image comes in various sizes and amazingly interesting motifs. 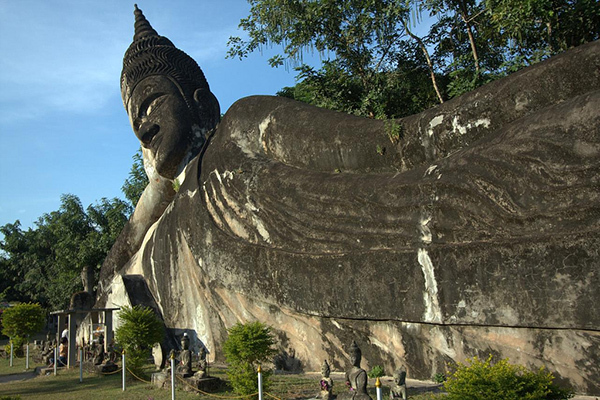 In addition to exploring some of the world’s most renowned ancient images and statues of the Buddha Park, the park offers an extremely relaxing and comfortable break where you can take time to have a sip of your favorite refreshing drink and enjoy the most tranquil time ever by relishing the spectacular and stunning sunset over the Mekong River. There is no better way to live life to the utmost than savor scrumptious local eatery including papaya salads, fried banana and cold Lao beer. Actually, Buddha Park is still one of the most refreshingly laid-back lands of the country attracting both visitors and backpackers from every corner of the world. 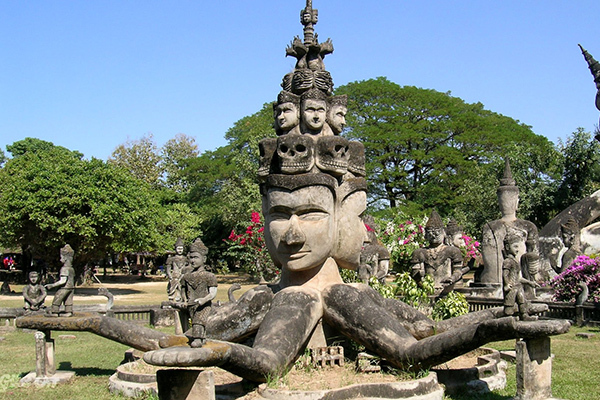 Location: Buddha Park is 25 kilometers away to the southeast if Vientiane, along the Mekong River. How to get Buddha: You are advised to go by tuk tuk or public bus.